Although it was one of the most important events in the history of palaeoanthropology, many details of the Taung discovery and the events that followed it are still not completely elucidated. 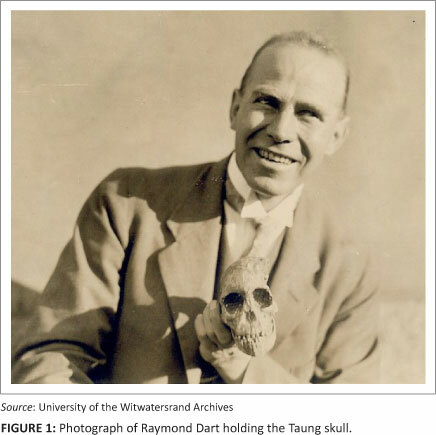 In this paper, we recount the events surrounding three early photographs (stored in the University of the Witwatersrand Archives) showing the Taung Child skull being held in the hands of the renowned anthropologist Raymond Dart. Having, what seems to be, a mosaic of evidence both for and against, we deliberate upon whether the archival photographs presented here are among the first photographs of the fossil itself or are of the first plaster cast of the Taung Child which was prepared for the 1925 British Empire Exhibition held at Wembley, London. 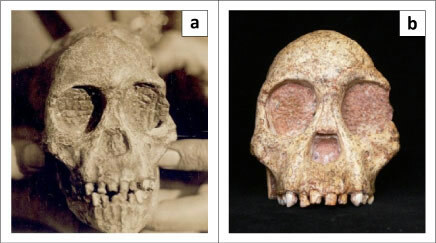 We interpreted the photographs and determined their provenance through analyses which included historical examination of published accounts of the Taung discovery and archival materials, as well as comparisons of the photographed material in question with both archival and current (digital, high quality) photographs of the Taung fossil itself and Taung skull casts (as the skull underwent changes over time). We conclude that the early photographs presented here are of the original fossil itself and not of a cast. At the same time, these photographs represent some of the first pictorial depictions of the Taung Child skull. The discovery of the fossil which became known as the Taung Child and its subsequent description and interpretation as a new hominid species - Australopithecus africanus1 - by the Australian-born South African anatomist and anthropologist Raymond Arthur Dart of the University of the Witwatersrand, Johannesburg, are now seen as some of the most significant events in the history of palaeoanthropology.2,3,4,5,6 Interestingly, some details concerning the history of the discovery, its announcement in February 1925 and the events that followed it, are still unknown.7,8,9 As Tobias noted: 'Uncertainty exists as to the exact date of the find, while several other aspects of its early history are subject to conflicting accounts in the published history. '7 Any new information on the discovery and related events is therefore of considerable historical importance. In this paper, we deliberate on the origin and content of three early photographs which recorded the events surrounding this important episode in the history of palaeoanthropology. The University of the Witwatersrand Archives hold Raymond Dart's papers, including many of the materials associated with the discovery of Australopithecus.10 Among these papers are three early photographs of the Taung Child (shown here by permission of the Archives). Although previously published - photograph 1 (Figure 1) in Wheelhouse and Smithford11, and photographs 2 and 3 (Figures 2a and 3a) in Strkalj12 - these photographs are not well known and lack reliable historical contextualisation. In this paper, we offer a detailed interpretation of their content. The provenance of the three photographs remains a puzzle. Neither the person who took the photographs nor the exact date on which they were taken are known. The three photographs in question were deposited in the University Archives in the same envelope. The first photograph (Figure 1) shows Raymond Dart himself holding the skull, while the other two (Figures 2a and 3a) provide larger and more detailed views of the left lateral and frontal aspects of the skull. The fact that the photographs were filed together and depict the same subjects and theme (Raymond Dart in the same light-coloured suit holding the same object in his hands with the same light and shadow patterns) strongly attests to the photographs having been taken at the same time. Two dates - 1924 and 1925 - were recorded on the back of the photographs in pencil and in a handwriting which was not Dart's. The dates were undoubtedly added at a later stage and reflect the uncertainty of the writer as to the exact date on which the photographs were taken. In this paper we attempt to present a more accurate account of when the photographs were taken as well as an analysis of the photographic content. To this end, we needed to determine whether the photographs presented here were among the first depictions of the Taung Child fossil itself or whether they were of the first plaster casts of the Taung Child prepared for the 1925 British Empire Exhibition at Wembley, London. At the time of the discovery, Dart did not possess a camera, either at home or in his department.13 To obtain photographs of the Taung fossil for his first publication (in The Star issue of 03 February 1925) he recruited a professional photographer - his friend - Len Richardson. Richardson, who was working for the Johannesburg newspaper The Star, had on several occasions already provided photographs for Dart. The images produced by this Johannesburg photographer later appeared not only in Dart's paper in Nature1 but in a number of subsequent technical and popular publications. The possibility exists that when Richardson took photographs for publication he also took 'informal' photographs of Dart and his fossil (the three images presented here) as mementos. If this is the case, the question remains: which of the dates written on the back of the photographs is the correct one? If Richardson was not the photographer of the three photographs presented here, or if they were taken on a separate occasion, it is possible that both dates written on the back of the photographs are wrong. In any event, the photographs could not have been taken later than 10 July 1929, as by that date Dart had finally separated the upper and lower jaws13 (the mandible being still attached to the maxilla prior to this date). Also, no casts of the fossil, except those prepared for the British Empire Exhibition (see below), had been produced up until this time. Content - cast or original? The abovementioned interpretations may be accepted if the photographs show the Taung fossil itself. Both Wheelhouse and Smithford11 and Strkalj12 assumed that the photographs described here show the original Taung fossil. However, two observations question the veracity of this interpretation. Firstly, the seemingly nonchalant manner in which Dart holds the skull (with one hand, clutching the side of the base between his fingers) in Figure 1 and, secondly, the colour of the natural endocranial cast in Figure 2a. If one observes the rarely depicted left lateral aspect of the photographed endocast, one notices that it is dark in colour (as it is on the cast, see Figure 2b). This observation appears to be contrary to that of the fossil where the surface of the natural endocast is covered by, in Dart's own words, 'glistening white calcite crystals'13 (Figure 2c). It is difficult to compare the photographs in question (Figures 2a and 3a) with the first published photographs taken by Richardson in 1924. Although the 1925 Nature publication1 showed a few photographs of the Taung skull, none of these were of the distinctive left lateral view of the skull (and the endocast). This view of the skull is the one which was shown in Dart and Craig's 1959 book Adventures with the Missing Link,13 but the quality of the photographs is poor. Could it then be possible that Dart did not hold the actual fossil, but rather that the skull depicted in the photographs we present here is one of the first plaster casts of the famous fossil produced in the spring of 1925? The 1925 British Empire Exhibition, reopened by King George V on 09 May 1925,16,17 was a grand occasion and provided an opportunity to present the discovery to the large number of visitors in the Empire's capital, London. It was, therefore, a perfect setting for the first public display of the Taung skull outside South Africa. Dart took the preparations for the exhibition very seriously and assiduously strived to present his discovery, himself, his university and, indeed, South Africa, in the best possible light. The booklet on Taung, which complemented and explained the exhibits, was written by Dart's mentor from the time he had worked in London, the renowned neuroanatomist and anthropologist - also Australian-born - Sir Grafton Elliot Smith.18,9 The booklet provided a brief account of Australopithecus africanus, a history of its discovery and a description of the exhibits. Dart, together with his students and staff, prepared the charts and casts for the exhibition. (These were augmented by some comparative material obtained from Elliot Smith from his own anatomy department at University College London). The preparation of materials proved demanding as Dart was constrained by the lack of resources and expert assistance in Johannesburg. However, he managed to derive the best from what little he had. The products turned out to be most satisfactory, and Dart, as can been seen from his later recollections,13 was quite proud of the materials he prepared for the exhibit. It is little wonder, therefore, that the final product could have been photographed and the photographs retained. The nature of the analysed historical materials is such that they are difficult to interpret with a high degree of certainty. 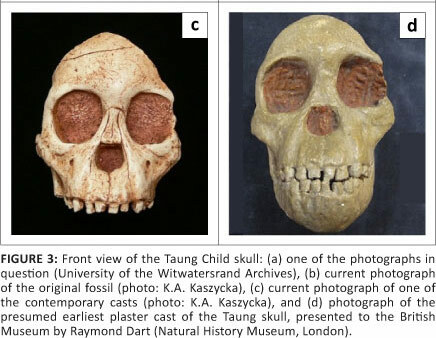 In the present case, however, the key evidence most strongly suggests that the three early photographs described here depict the actual Taung fossil itself. Taken not long after the discovery (before July 1929), the photographs were never published by Dart; one may assume that he did not publish them because of their rather poor quality and retained them for personal record rather than for public display. The photographs were kept in the Dart family collection, probably as precious mementos of one of the important events in Raymond Dart's career. After Dart's death in 1988,20 the photographs, together with other historical materials in the Dart family's possession, were deposited in the University of the Witwatersrand Archives (Tobias PV 2005, personal communication to GS, March 07). The photographs described here represent only a fraction of the treasure trove of historical materials held in the University of the Witwatersrand Archives.3,21,22 These valuable materials will undoubtedly be instrumental in casting more light on the history of palaeoanthropology in South Africa, as have those described here. We thank M.H. Wolpoff for his comments on the first draft of the manuscript; K. Mothate for her assistance and permission to publish the photographs from the University of the Witwatersrand Archives; R.G. Kruszynski for checking the British Museum Archives and for the courtesy of taking and sending the photograph to one of the authors (K.A.K. ); and D.J. Chorn for proofreading the manuscript. G.S. conducted the archival work and contributed to the data analysis and writing of the paper; K.A.K. contributed to the data, the photographic analysis and the writing of the paper.